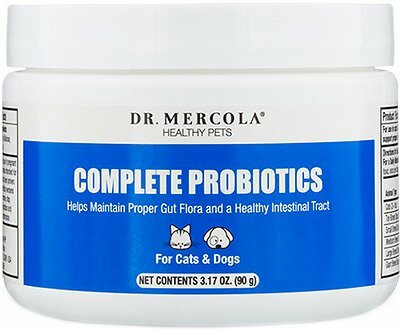 Help support your pal’s gastrointestinal health and wellbeing with the Dr. Mercola Complete Probiotics Dog & Cat Supplement. This probiotic formula brings together 10 of the most powerful probiotics, or “good bacteria”, known to promote optimal digestive and immune system health in cats and dogs. Every serving provides over 58 billion probiotics that can be easily mixed with your pal’s food at mealtime. The probiotics not only improve digestion and immunity, but they also help unlock nutrients from foods, like vitamin K and B vitamins for energy and overall wellbeing. Plus, it contains no wheat, gluten, corn, or soy so it’s ideal for pets with sensitive tummies. Provides blend of probiotics, or “good bacteria” to promote digestive and immune health. Brings together 14 probiotic strains, including 10 of the most widely known to promote optimal digestion and immunity. 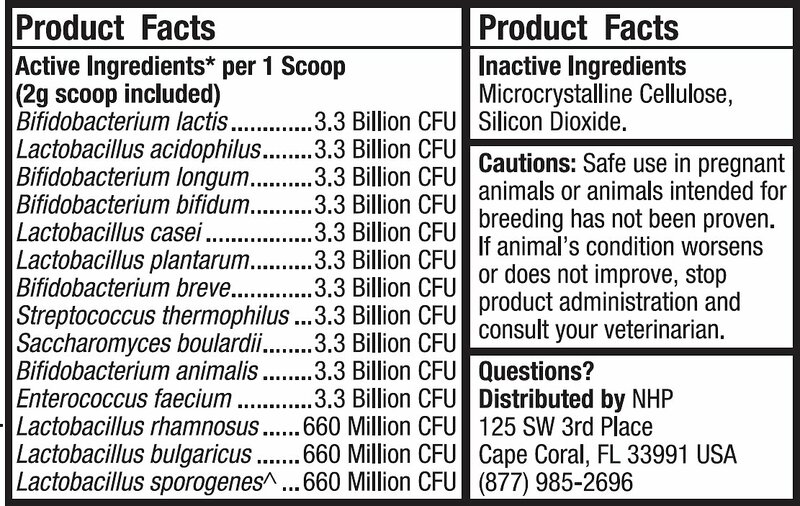 Contains 58 billion CFUs, or colony forming units, probiotics in each serving for maximum potency. Probiotics help unlock nutrients from foods, like vitamin K and B vitamins for energy and overall wellbeing. Easy to mix into food daily for adult cats and dogs of all breeds and contains no wheat, gluten, corn, or soy. Bifidobacterium Lactis, Lactobacillus Acidophilus, Bifidobacterium Longum, Bifidobacterium Bifidum, Lactobacillus Casei, Lactobacillus Plantarum, Bifidobacterium Breve, Streptococcus Thermophiles, Saccharomyces Boulardii, Bifidobacterium Animalis, Enterococcus Faecium, Lactobacillus Rhamnosus, Lactobacillus Bulgaricus, Lactobacillus Sporogenes, Microcystaline Cellulose, Silicon Dioxide. Mix each portion with food, once per day. I started both my kittens on this when 1 was prescribed antibiotics and it gave her diarrhea. Therapeutic dose. Both had no mama kitty milk and were bottle fed so I’ve had issues getting them normal stools. I take a spoon of their fish food and mix it and put it on top in the middle of the dish. They have had no issue with the taste. I’m slowly reducing the dose to ween them off as they get back a healthy flora. It Works for my Cat. I gave my cat probiotics to help him with his fur ball issues, and I could see his tummy bloated! That is the sign of the probiotics working and I am glad it worked. He seems to do better with less vomiting of fur balls. After I adjusted it to a much smaller portion, my cat was ok. I will continue sprinkling a small bit of the powder on his dry kibbles. The ingredients are all listed, it is less expensive than other products, and all three of my dogs were not negatively affected (gas, bloating, abdominal pain, etc.) by this product. I highly reccomend this one! My cat was diagnosed with IBD. Special foods alone did not help with his digestive issues and his frequent vomiting- even another brand of probiotic. Although expensive, this seems to be working so far. And, it apparently "hides well" in wet food, unlike some others I've tried. The only reason for just 4 stars is the short scoop included in the container. It gets buried under the product and is difficult to find and use without wasting the powder. I finally just used a teaspoon. Much better than the Fortaflora. Our cat will not touch it but he loves this. We have no problem with him eating it with his food. My dog (4yr Rottie) has an extremely sensitive stomach and has had loose stools quiet frequently throughout his life. Using this product every day (along with Dr. Mercola's Digestive Enzymes) has made it a lot easier to pick up his poop!!!!!! I stopped buying it for a while to try other products, but i switched back since nothing else worked as well. And yea- the container isn't filled to the top. Oh well. Of course more product would be nice, but don't be surprised at the quantity, instead be pleasantly surprised with the quality! Background — My AmStaff has very serious allergies — food and environmental. (To be honest, I think he suffers from leaky gut.) Either way, his vets just keep putting him on more and more meds with little-to-no progress or healing. I've been frustrated by watching him constantly suffer, so I'm now trying to help him through supplements and my own research. Regarding this probiotic — He is on freeze-dried raw dog food and it was clear he wasn't digesting well. I had him on another probiotic and it did nothing. I switched to this one and his digestion improved drastically! Smaller, more digested, and less frequent poops. I highly recommend this! These probiotics resolved my senior cat's digestive problems in less than a week. No more diarrhea and no drugs. Easily mixed into his food. And my Vet approved. I was skeptical about giving my cat probiotics, but after much research on this product and overall probiotic use, we decided to try it. We haven't seen any negative side effects. What we have noticed is he seems more energetic, playful, and loving. His hair/skin looks better, it's helped with hairballs, and he doesn't dig at his ears as much anymore. I mix it with a little gravy from the Rachael Ray Nutrish topper and he licks the bowl clean. Then I give him the rest of the topper in the pouch.